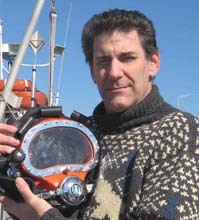 My web site is named Dan Lieb - Art & Underwater Illustration because some of my work takes me underwater where I work with archaeologists to map and record submerged sites. These drawings appear in journals and reports. I am a trained technical illustrator and have been working as such since 1978. I have also spent much of that time creating documentation graphics and creative illustrations. All three of these areas of commercial art have enabled me to create visuals that clearly communicate concepts and ideas. You may e-mail me directly at dan@aqualieb.com to discuss rates and turn-around time. You may also call me at 732-776-6261 or on my cell at 732-513-5698.